We blog not because we want to brag or cause envy. We write about our Expat Life because we wanna share our experiences. We write about our travels, limited as it may be, because we wanna inspire others to see the world and its beauty. Having said that out there, WELCOME to www.RyeAndCai.com. We are sure that you are curious about this blog, about us, why we do this and all that. Well, we have thought of what you might be asking and decided to answer them in the FAQ’s below. Who are Rye and Cai? 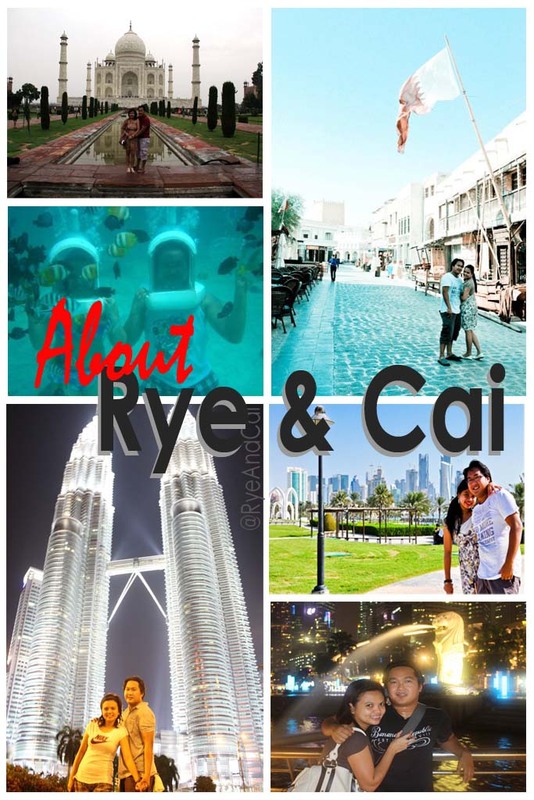 We, Rye and Cai, are the Expat Couple behind this blog. We are currently residing in Doha, Qatar. Related Post: What is an Expat? Rye is an Architect who’s been in Qatar since 2008. Cai is a Chief Accountant who came to Qatar in 2011 to have Professional Growth and (although she will undoubtedly deny it) to be with Rye as well. We read somewhere that one should keep a journal because it gives them the chance to relive the emotions they felt during that moment. Having a blog enables you to have a repository of memories that otherwise might be forgotten. And that is why we blog. Rye have always fancied writing. Though he may not be good at it (he knows that he has grammar, punctuation, spelling and other English mistakes) he still likes doing it. He's had a lot of blogs before but often, he neglects to maintain it regularly just like the blog he started in tumblr – RyeAndCai - when Cai finally came to Doha. His most recent blog, Notes of an Expat Architect, was already getting the traffic he desires but he encountered a "tech" problem so he had to shut it down. With the demise of Notes of an Expat Architect, he was inspired to revive RyeAndCai, this time, on its very own domain. Having involved Cai, this brand new "old" blog will have more topics to discuss other than his profession. Thus, in 2014, www.RyeAndCai.com became live but we became busy living life so posts became as infrequent as rain in Doha. However, in 2018, we decided to re-launch the site and make it even bigger and better. We are not a celebrity nor do we aspire to be. We are just two ordinary people living life the way we choose to. We work; eat-out; enjoy what life has to offer as Expats in Doha; travel and; make memories and adventures in and beyond Qatar. www.RyeAndCai.com started out as the journal of our interests and experiences but it became a chronicle of the places we've been to when we noticed that most posts that gathered views were the ones about Qatar and our travels. And so, this blog will be about our current location, the places we've been to, the places we wish to visit and of course, our other interests. However, not forgetting the initial reason for this blog, we will not just focus on the place but we will also incorporate the emotion, the effect and the overall feeling we have in relation to where we are. We will throw in facts and guides but the experience is still the main focus. As the blog progresses, new topics may be included and anything and everything might just be featured. We will share how it is to be an expat. We will give a glimpse of life living away from the land of your birth and making a new home. It is our goal to write about the must-know, must-see and must-do in our current location - Qatar. This is meant to guide you, the readers, if you are interested in learning more about our first home away from home. Someday soon, we might move somewhere else, hopefully bringing you all with us through www.RyeandCai.com. We are not hard-core backpackers. We don’t intend to quit our jobs to travel the world. Although that idea came up, we decided that it is best to find balance between having a professional career and travelling. We are vacation-goers. We enjoy travelling together by ourselves and we also enjoy sightseeing with our family and friends. When there’s enough budget, we indulge, otherwise, we make do with what we have. In this blog, we tell stories about our trips in the hope to inspire readers to travel as well and guide them in doing so. The world is such a beautiful place and it'll be a waste if people don't get to personally see it. We will review Hotels, Restaurants, Books, TV Shows, Music, Movies and other stuff worth our time. We would recommend and make comments truthfully and based on our actual experience. In cases where we get invited to try out products and services, we would be straightforward and label posts as advertisements or sponsored, while staying true and honest with our commentaries. If there are standard press releases, we will surely re-write them to match our actual feelings about the product and service. We will only recommend those products that we believe in and actually use and/or will use. We will not mislead you, our readers, in any way.